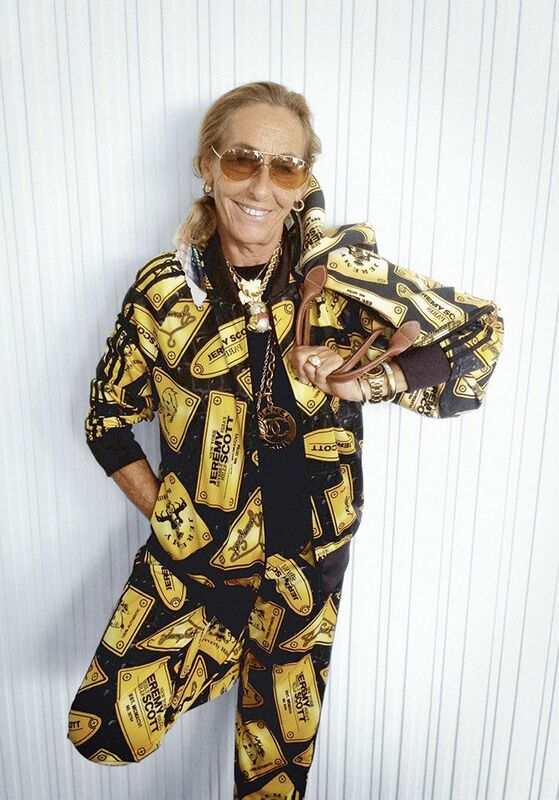 Carlyne Cerf de Dudzeele's life story reads like a fashion fairytale. She became obsessed with fashion at an early age growing up in St. Tropez and Paris, and made her first big splash in styling at French Elle before becoming a style icon in New York. Known for her opulent taste -- a crisp white shirt festooned with layer after layer of gold and pearl jewelry is her idea of a casual Friday -- de Dudzeele dressed Israeli model Michaela Bercu in a Christian Lacroix jacket adorned with a jeweled cross for the cover of Anna Wintour's first issue of Vogue, single-handedly launched a Pucci print revival and redefined the word panache. She brings together the chic of Paris with the enthusiasm of America and ties it all up in a leopard-print bow. De Dudzeele either "loves it, loves it, loves it" or declares it dÃ©modÃ©. The stylist recently dressed Miley Cyrus in a sports bra for the cover of V and she's become obessessed with Jeremy Scott's "baroque sportif" tracksuits. (She's been feeling an athletic vibe.) While in L.A., we got de Dudzeele and Scott to meet up and chat about the "du chien" of Chanel and how fashion is still all about the attitude. 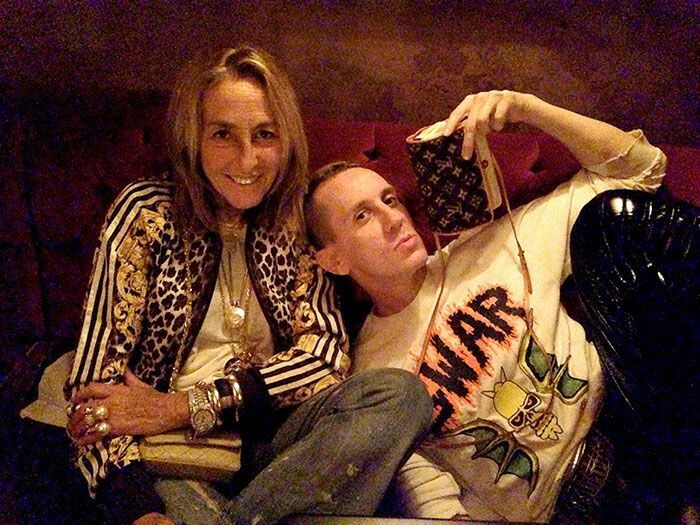 Jeremy Scott: What is your first fashion memory? Carlyne cerf de Dudzeele: It was "du chien." "Avoir du chien" is an expression, it means chic! It's an attitude, it is not physical. Chanel had "du chien," people with personality have "du chien." I wanted to work for Chanel. JS: Were there things in magazines that you would draw inspiration from? CCD: [German model] Veruschka [Von Lehndorff]! I had magazine subscriptions at home and I would stare at her for days. I was obsessed. I still like the idea of not having much makeup and hair. I was obsessed and I have met her since then! JS: You lived in St. Tropez? CCD: My mother divorced and bought a house in St. Tropez and took me and my sister there. My mother was studying. We would spend hours in the garden with our baby cat. It was lovely. JS: It's important for creative people to have an environment where they feel loved and free and creative. When you left St. Tropez where did you go? CCD: My father thought my sister and I were not raised the way we should be. So we went to Paris and lived with him and my stepmother. He put me in a very strict private school. I just wanted to make everyone laugh. I was doing a lot of bad things at that time. Later on they mixed the boys and the girls. That was perfection. One day my stepmother found letters that I had written to my sister and that night at dinner my father said, "I have to talk to you." After that, I left to live with my mother's sister and I never came back. I lived in my grandmother's room and became an assistant at Marie Claire. It was heaven. Then I went to DÃ©pÃªche Mode where it was the beginning of everyone: actors, editors, all the photographers were there. And then I moved to French Elle. JS: Is Elle when you first started to feel like you were coming into your own? CCD: It was good. We had a lot of fun. That is the key. And it was fast fashion, every week. If something was not so good, who cares? There was another one. It was quick. It was emotional, not cerebral. JS: What is the biggest problem you see in fashion today? CCD: Ninety-nine percent of people working in fashion are not people who love fashion. They are just there because they feel like they can make it quick. They are not passionate and they should not be there. They have no style, but they work in fashion. I see these girls who want to be in fashion because it is cool, but they are clueless. They don't get it. They don't know what an attitude is. JS: What else has inspired you over the years? CCD: I loved when traveling was glamorous. I drew inspiration from that, the people in the airports. Now people dress unstylishly to travel. They are no longer chic. CCD: I am! I was best friends with AndrÃ© Leon Talley and he introduced me to my best friend in New York, [Manolo Blahnik CEO] George Malkemus. I don't wear anything that doesn't represent me, I just wear what I love. I don't have to show off. If I wear a black jacket, that is me. JS: What is one thing that has been constant about style? CCD: Jeans. I was raised with fur coats and jeans and big lace things. Don't dress trendy. Classic things are the most chic. I hate seeing things that are dÃ©modÃ©. Things are like that right now, and it is not good. It doesn't work. Jeans always work. Classics are chic. A classic Chanel jacket will never be dÃ©modÃ©. It's still perfection. Perfection is not about money. It is the way you put it together, the way you edit. All people care about now is designer names and that is not chic. I can go anywhere in my black pants and black jacket and it is perfection. I don't wear the designer clothes of the season. They are not always good. AlaÃ¯a is never dÃ©modÃ©. The classic Chanel bag, the classic HermÃ¨s -- never dÃ©modÃ©. The bag companies now... I can't look at them! JS: Do you remember the first Chanel show you saw? CCD: I know it was pre-'81, pre-Karl, because I moved here in '85. It was different back then, the models would talk and dance. Now they are babies, they have no idea. They don't have the culture that the girls used to have. No one is teaching the girls these days. I used to teach the models. Steven Meisel would teach them attitude. Now they have no idea. De Dudzeele's over-the-top-styling in V magazine's Spring 2012 issue. JS: What do you think the future of fashion is? CCD: I think it's too much fashion, too much clothes, too much boring, not in the now. Life is more active now. When I see an editor in the city, they are off to work, so being comfortable is important. If you put a dress on, it should be comfortable. There needs to be less rigidity. I think black people are more stylish than white people. They have more of a personal style. Even if black people go crazy, they don't look too crazy. It is more authentic -- it works. I miss when people used to mix high and low fashion. I mix things from Zara and Forever 21. Now people only wear designer. JS: What do you think about online fashion resources like Instagram? How has that shifted power from magazines? CCD: I don't look at magazines anymore, I prefer to be on the Internet. I love street style, but when I see all these photo collections, I don't like it. Before, you would never know they were taking a picture of you: now people know and it is all posed. They try to be photogenic. I do like the Internet, I don't know if it will change fashion. JS: Were you ever into vintage? CCD: Of course! I have all the periods of everything, but now I cannot wear something I have worn already. I keep everything. And I went for it back in the day, I wore everything. When I wear classic pieces, people go insane. This is fashion to me. I miss this. I miss the energy. Fashion should be amusing. Now it's pretentious. It's not fun. V Magazine Photograph by Sebastian Faena. Jeremy Scott and de Dudzeele photograph courtesy of Jeremy Scott.